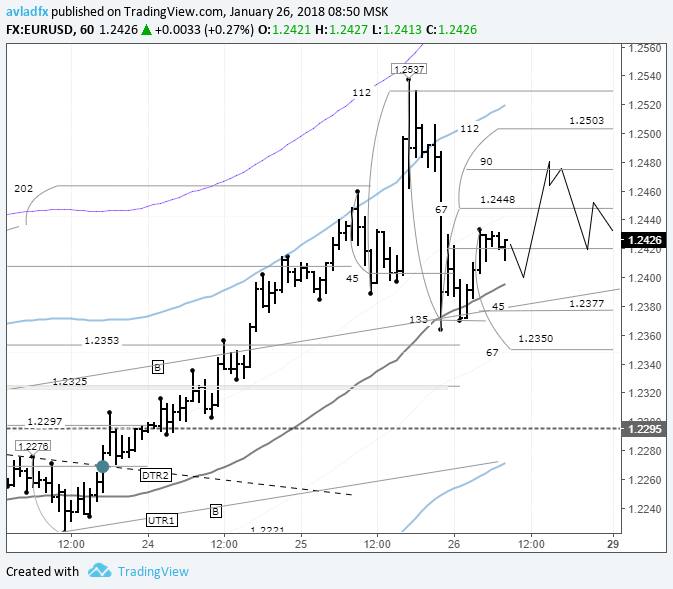 On Thursday the 11th of January, the euro jumped again after the minutes of the ECB’s latest meeting on monetary policy were disclosed. This sent Eurobonds up, along with the euro crosses and our main EURUSD pair. The European regulator remarked that the economic situation is improving, so it’s possible that the bank could revise its monetary policy in the early stages of this year. The sharp rise of the single currency and weak US inflation data put the dollar under pressure. The producer price index for December dropped by 0.1% against a forecast of +0.2%, and a previous reading of +0.4% (a negative factor for the US Fed). On Thursday, trading on the euro closed up above 1.20. Now we’ll look at the hourly chart and construct some intraday models for the past 3 days. The only way to protect yourself from unexpected news items is through stop levels. Since the minutes of the ECB meeting were published, the euro has recovered to 1.2066, with this recovery extending into the Asian session. Growth stopped at around the 112th degree. The area between the 112th and 135th degrees is a reversal zone, so the euro could drop to the LB balance line without hindrance during the European session. Since yesterday’s upwards movement hasn’t been erased, like it was on Wednesday, I think a triple top could form today. I’ve gone for a triple top because in Asia, all the euro crosses are trading up. I’m sure that on these rising crosses, buyers will try to reach new highs. So, once a new high is reached, if there’s a double bearish divergence between the AO indicator and the price, we can start looking downwards. 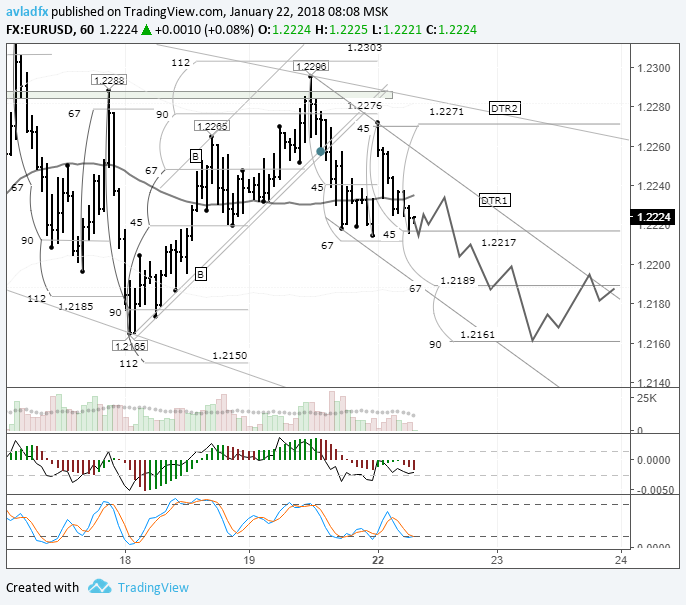 The target is 1.2075, with a closing price in the region of 1.2042. If the crosses reverse, the target will be 1.1984. If the crosses are falling, the 45th degree won’t stop sellers. The fundamentals have pushed the euro into overbought territory. This zone is located between the U3 and U4 lines. The U3 MA line diverges from the LB (sma 55) by 1%, while the U4 line diverges by 1.62%. The price is in this zone very rarely, and never for long. Given the national holiday in the US today and the lack of economic events in Europe, my forecast for today is looking downwards. If Friday’s movements are in one direction, I predict Monday’s movements to go against Friday’s, without giving any consideration to the news. In Asia, buyers have shifted the maximum to 1.2240. Having exited the wave structure, it’s time for a correction on the euro. The 45th and 67th degrees have been shifted to 1.2185 and 1.2157 respectively. I’m well aware that as long as there are a lot of willing buyers for the dollar, the major players will be trying to push the euro up in order to change sellers’ minds and induce a reversal. When they start to believe that the euro is on the rise and start reversing their positions, the major players will abandon the euro to induce another reversal on our pair. 84% of open positions on the EURUSD pair at the moment are short. 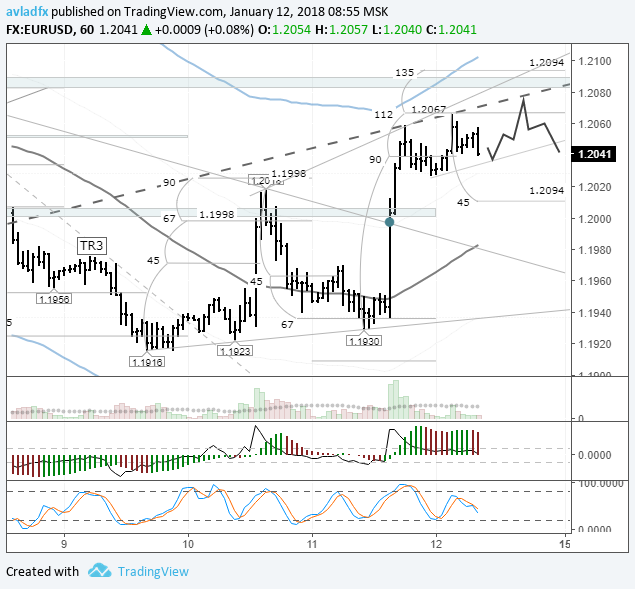 On the current hour, the trend line runs through 1.2157. If we project this line into the future, then in the case of a decline, the price should meet this line at 1.2187 at 15:00 (GMT+3). I’m planning to take profit on the correction to the LB line. On Friday the 19th of January, despite a price surge to 1.2296, trading on the euro/dollar pair closed down. The euro dropped against the dollar to 1.2214 before trading closed in Chicago. The euro’s decline was brought about by a rise in US bond yields as well as market participants awaiting the results of an SPD vote in Bonn on whether or not to enter formal coalition talks with Angela Merkel’s party. US 10Y bond yields have risen from 2.61% to 2.66% (high from 2014). The greenback received also some support from the President of the San Francisco Federal Reserve, John Williams, who said that the Fed would continue on its path of gradual rate hikes in 2018 and is looking at about 3 rate hikes for the year. Despite the fact that the price deviated from projections at the beginning of the European session, the price hit its target during the US session. On Monday, trading on the euro opened with an upwards gap after the US government shutdown on Saturday and the agreement to hold coalition talks over the weekend in Germany. Trading on the euro opened at 1.2270. Now, sellers have closed this gap completely and the euro is trading at 1.2226. The US government has temporarily shut down. The White House has blamed the Democrats for this due to them having blocked federal funding. The US economy, however, doesn’t directly depend on the government. Traders have adapted to this turn of events and so there isn’t expected to be long-term fallout from this. What will affect markets is not the fact of a government shutdown, but its duration. The last government shutdown lasted for 16 days, running from the 1st to the 17th of October, 2013. Top representatives from both the Republican and Democratic parties held talks on Sunday. The US Senate is to vote on the extension of government funding at 06:00 GMT. At their party conference in Bonn, the Social Democratic Party (SPD) voted for official coalition talks with Angela Merkel’s Christian Democratic Union (CDU). This is expected to result in the formation of a new coalition government with Angela Merkel at the helm. So, what can we expect from the euro today? After a decline in the Asian session from 1.2272 to 1.2216, a correction is on the cards, with quotes expected to rise to 1.2255. My forecast has the euro dropping from 1.2236/40. My forecast is for the next 2 days. 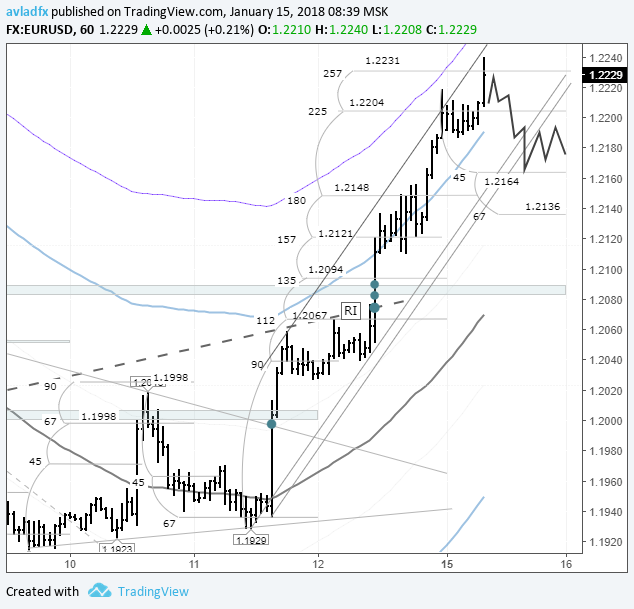 If the DTR1 line holds its ground, we can expect the euro to open at around 1.2162 on Tuesday. For now, sellers need to break through the 1.2210 – 1.2215 range. I have no desire to analyse markets when they react so strongly to verbal interventions because at times like these, the major players rely on crowd psychology to guide their trading. Also, we don’t know what other statements we could get from officials. It was enough just for Trump to say that Mnuchin’s comments were misinterpreted for the euro to slump by nearly 200 pips.